Today is my 28th birthday. It's really kind of weird for me to say that, and not because 28 is big number or anything, but because I kind of swore off birthdays last year. Now, let me explain, birthdays have largely been a disappointment for me for most of my life. I always expect people to make a bigger deal out of them than they end up doing. 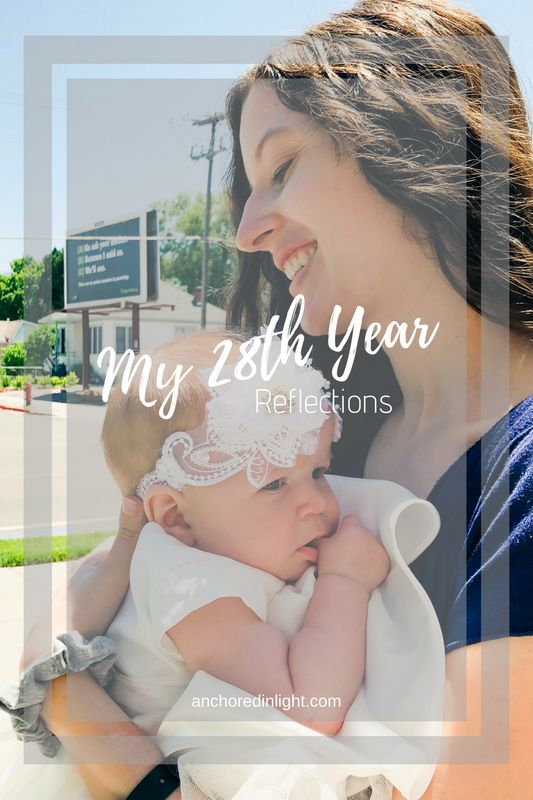 So last year, when I was pregnant with Everly, everyone told me to make the most of it because it was going to be my last birthday without a baby. Over and over people pounded into my head that I wasn't really going to get a birthday after that one. So I did make the most of it. I made my own cake (a tradition I started for myself when I got married), I took a bath with a sparkly bath bomb, I went out to lunch with my family, and I mentally let the concept of birthdays go. No longer was there a special day of the year that was all about me, I'd been holding onto that idea for too long anyway. So this year I basically forgot that my birthday was coming. People kept asking me about my birthday and I kept thinking, "Birthday? What's a birthday?" I'm actually a little impressed with how far I mentally let go of birthdays. For me, now, birthdays are the day I get to start saying the next year. They're a time to reevaluate who I am and my goals, but they're no longer a day about presents or special treatment. 1. This year I learned that I'm way more environmentally conscious/concerned than I ever thought I would be. I blame part of it on my husband. I'm in serious danger of swinging way too far to one side. I keep wondering where my products come from and are they from local businesses, and how will they impact the environment?? My new buying mantra is less about what is cheapest, and more about what is best for the environment and the people around me. 2. This was the year that I dived deep into minimalism. Earlier in the year, I read The Life-Changing Magic of Tidying Up, combined with the fact that we moved and I am right on track to get rid of almost everything I own and stick to what I really need/love, and a lot of books. I'll probably always have a lot of books and I'm really ok with that. Up until this last year, I wanted a big house with lots of rooms. Now I think that I'll be quite content with a house that's small and clean and cozy. My dream home went from being a towering thing on a beach cliff somewhere to a cottage of some sort (also probably on a beach cliff somewhere...). 3. This is the year that I committed to my writing. I've committed and re-committed to writing so many times that it's a little ridiculous, but this is the year that I read Big Magic. I decided that I was going to start writing almost every day. That I was going to make it a priority. That I was going to write for me, but also that I was going to give publishing a shot. So, after writing 10 first draft novels, I am finally revising one. I have no idea whether it will actually get published, but we'll see what happens. I redefined my idea of writing success for myself and while I'll be thrilled if I get published someday (and plan on working on that for the rest of my life), I'm ok if I don't. Success for me will be to be a lifelong writer. I can control that. I can't control if anyone else will like it or buy my books. 4. This year I fell in love with my body. I've always wanted to be someone that took care of their body because they loved it, not because they hated it. I've been at war with my body most of my life. I wanted to be the skinniest. Now, after having watched it grow and change and shrink mostly back to its normal size I am just so amazed by what it has done and what it is capable of doing. I find myself working out because I enjoy it, not because I'm worried about my weight, in fact, I rarely weigh myself. I try to eat intuitively. If I'm hungry for a salad, I have a salad, if I want a burger, I eat a burger. I don't tell myself that anything is off limits and I don't criticize myself for eating things that are "bad" or "unhealthy". That all said, there are still things that I don't love about my body, but I'm the happiest that I have ever been with it and I'm going to continue to work on loving it and taking good care of it instead of warring against it. 5. This year I became the most intentional that I have ever been with my time. I've always wanted to keep myself from falling into the trap of wanting to be constantly entertained. I've learned to let myself be bored and not reach for my phone all the time. I try to use it as a tool rather than a device for entertainment. I use the Moment app to help me know how I'm spending my time on my phone. Because I've been so conscious of it I've allowed myself time for things that I really enjoy and are more worthwhile for me. I've spent more time reading and writing and spending time focused solely on my family. I don't think I'll ever be one that completely quits social media, because it is a good tool and it brings me joy, but I've learned to not make it the center of my thoughts at all hours of the day. This year has been one of immense growth for me. I feel so different from the person that I was before. So much has changed. We grew our family and we've moved. 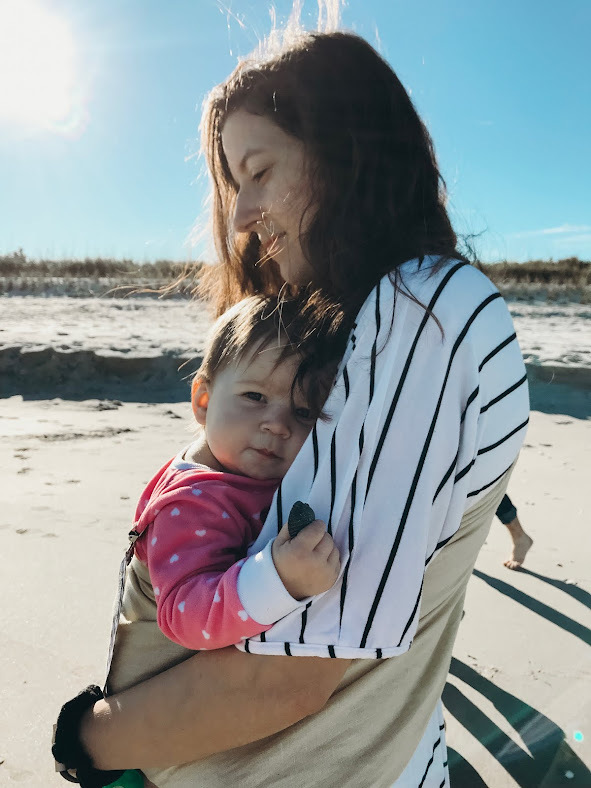 I fell in love with motherhood (I still vacillate in my mind between wanting a million babies and just loving Everly so much that I think I could be content with just her for the rest of our years). It has been a beautiful splendid year. It has not been easy, but most of those hard things have led to the growth that I'm so grateful for. I'm truly excited to see what the next year of life brings! How do you celebrate your birthdays? How do you feel like you've changed in the last year?